Another Blizzard: What Happened to Global Warming? When will we face up to reality? That was the question Al Gore asked with his 24-hour, worldwide presentations on global warming last week in an online program he called Climate Reality. In the day's last speech  presented in person in New York City  Gore delivered a passionate condemnation of efforts by the fossil-fuel industry to spread doubt about climate science. He tied the recent rash of devastating disasters  heat waves and floods and storms  to rising carbon emissions and predicted more devastation on a warmer planet in the future. Most of all, he called on his audience of more than 8 million viewers online to act. "Climate change is not really a political problem," he said. "It's a human problem." In other words: wake up and smell the burning planet. Gore made the scientific consensus seem stronger than it really is  especially on the connection between rising temperatures and extreme weather events, which is still evolving. (As the environmental scientist Roger Pielke Jr. likes to say, climate models often serve as "ink blots"  people tend to read their own preconceptions into the data.) But Gore deserves credit for doggedly pushing his case in the face of obfuscation and outright lies from many of his opponents. And he is essentially right that a warmer future does not look good, to say the least. Just a day after Gore's Climate Reality event, researchers announced that the Arctic sea ice cover had melted to its second lowest level on record  another reminder that climate change doesn't care about politics and will continue to unfold whether we believe in it or not. But there are other realities out there too  political and economic ones  and they're clashing with Gore's pure vision of climate reality. On the same day that Gore gave his presentation, the Environmental Protection Agency quietly admitted that it would postpone an initial round of greenhouse-gas regulations  the latest step in the Obama Administration's lengthy walk back of its promised climate policies. The bigger environmental news last week wasn't Gore, but the controversy over the solar start-up Solyndra, which took more than $500 million in government-backed loans and then promptly proceeded to go bankrupt, costing more than 1,000 people their jobs. Political reporters who rarely touch climate or energy issues were all over the Solyndra "scandal," as Republicans argued that the White House had shown favoritism to a campaign donor who was also a major Solyndra investor. There's not likely much merit to the charge, but the headlines have probably poisoned the well for any further major government investments in the renewable-energy sector at a time when those funds are desperately needed. Even outside the U.S., where climate skepticism is more muted, carbon-cutting policies are flagging. Britain has made some of the most ambitious carbon-reduction pledges in the world  promising to cut emissions 50% below 1990 levels by 2027  but a study released by the analyst group Cambridge Econometrics found that it was going to miss those targets by widening margins in the years to come. The money simply isn't there to do the job. Jonathan Grant, an analyst with PriceWaterhouseCoopers in London, told me that only half the $110 billion needed to clean Britain's electricity sector was available for investment. "Who will pay for the rest?" he asked. Indeed, while there are some bright spots in Europe on renewable energy  Germany, determined to get off nuclear power, has doubled down on alternative energy  the overall picture is not good as we limp toward the end-of-year U.N. climate-change conference, to be held this time in South Africa. Renewable-energy stalwarts like Spain and Portugal, for example  under great fiscal strain  are looking to curtail subsidies. I attended the B4E (Business for the Environment) summit last week in London, and the anxiety and frustration among the participants was palpable. The Kyoto Protocol's first, and so far only, commitment period  or the target date by which certain emission goals were to have been met  ends next year, and right now what seems most likely is that it will be replaced by nothing at all. And then there is the economic reality of the current energy system. The U.S. Energy Information Administration (EIA) released its annual International Energy Outlook on Sept. 19, and the picture of the future looks like more of the same. The EIA projected that energy demand could increase 53% by 2035, with half of that growth coming from just India and China. Oil consumption would keep rising, and while renewable energy would be the fastest-growing sector for electricity consumption, coal is still set to remain king. Fossil fuels would continue to supply almost 80% of the world's energy use by 2035, and carbon emissions  barring some kind of restriction  would rise by nearly 50%. If you care about climate change, that's a pretty grim forecast. This week will see another series of climate-related events in New York City around the meeting of the U.N. General Assembly. Pledges will be made  pledges to finally take long-term challenges like climate change, population growth and international poverty seriously. Political and economic realities keep postponing those promises, but eventually, climate reality is going to win out. 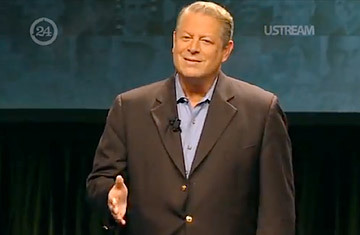 Gore likes to use a metaphor to describe the risks of climate change and extreme weather. It's as if we're rolling dice and every 12 represents a catastrophic event. Global warming, though, loads the dice, making it more likely that we'll roll big. Well, right now our global climate policy  mostly by neglect  seems to consist of rolling and rolling and hoping that warming turns out to be relatively manageable. There's only one problem: that's not a good bet. Read about what is happening to global warming. See TIME's special on how to win the war on global warming.